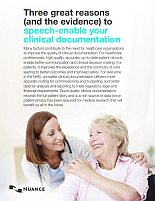 Why should you speech enable your clinical documentation now? One healthcare IT tool which has been shown to improve clinician job satisfaction and quality care, and ensure EPRs are complete and accurate, is speech recognition software. Speech recognition integrated into the EPR has been proven to improve the completeness and accuracy of the patient record and relieve the burden of administration for clinicians who feel better about their jobs. When documentation becomes a natural by-product of quality care. Beyond words. From the first word to the last code, Nuance is redefining the way clinicians interact with clinical documentation. Visit us online or call +44 800 0314388 to learn how to make clinical documentation a more natural part of the clinician’s workflow.